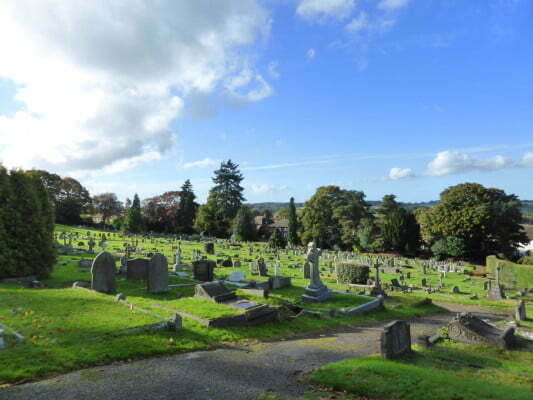 Where our cemeteries are located, accessibility and parking, rules and finding a grave. Farnham Town Council is the burial authority. This means we are responsible for burials which take place in the cemeteries, maintaining the cemeteries and the upkeep of the cemetery records. Directions to the cemeteries from the town centre. Each cemetery has a small car park. If you have a mobility or physical disability and would like to take your car to a graveside, please contact us using the contact details on this page. A map showing the general layout of the cemetery can be found on the noticeboards at the main entrance to each cemetery. If you would like to see a detailed plan showing the position and allocation of grave spaces please contact us to make an appointment. George Sturt (1863-1927) an author, and his sisters are buried in the cemetery. George Sturt, who was born and died in Farnham was a writer and keen observer of daily life and social interaction. His books include The Wheelwright’s Shop and Memoirs of a Surrey Labourer. Arthur J Stedman (1868-1958) an architect, completed some fine works in West Surrey including the McDonald Almshouses in West Street, Farnham. Eille Norwood (Anthony Edward Brett) (1869-1948) actor and compiler of the Daily Express crossword puzzle. He is best known for playing Sherlock Holmes in 47 silent films. Sir Robert Pringle (1855-1926) Major General in the British Army. He was director of the Army Veterinary Service and did much to improve military horse and dog conditions during the First World War. William Ellis (1831-1913) served in the XI Hussars and is said to have been the last survivor of the charge of the Light Brigade. His gravestone was bought by the XI Hussars and bears the regimental crest. The inscription reads: ‘He served in the XI Hussars and rode in the charge of the Light Brigade at Balaclava on October 25th 1854’. Mike Hawthorn – the UK’s first Formula 1 world champion in 1958. He died in a car crash on the A3 near Guildford in 1959. Harold Falkner – Early 20th century architect who helped to maintain Farnham as a Georgian town. Cobbett family plot – son and daughter of the late William Cobbett who was a radical political writer and who died in 1835. Charles Earnest Borelli – co founder of the ‘Old Farnham Society’, which aimed to promote conservation in Farnham in the early 20th century. He died in 1950. George Elphick – founder of the first Elphick’s department store in 1881 and who died in 1921. Farnham’s cemeteries have 74 Commonwealth War Graves. These belong to casualties of World War I and World War II. The graves are marked with the traditional memorial of Portland stone and are maintained by the Commonwealth War Graves Commission. West Street cemetery commemorates 40 Commonwealth War Graves Commission memorials. There are 13 war graves in Green Lane cemetery, 20 in Upper Hale cemetery and one in Badshot Lea cemetery. To find a grave download a list of names and locations of CWGC memorials. See the Commonwealth War Graves Commission website for records on the war dead. Farnham Town Council ensures that the four war memorials at Gostrey Meadow, Hale, Badshot Lea and Weybourne are maintained and legible. West Street Garden of Reflection is open to everyone and offers a quiet space to sit and reflect. The garden is planted with white flowering plants, which adds to the feeling of serenity. The garden includes a book in which commemorative plaques may be laid. Farnham’s cemeteries are a natural habitat for wildlife. An area in West Street cemetery near the water meadows is kept uncut during the summer months. 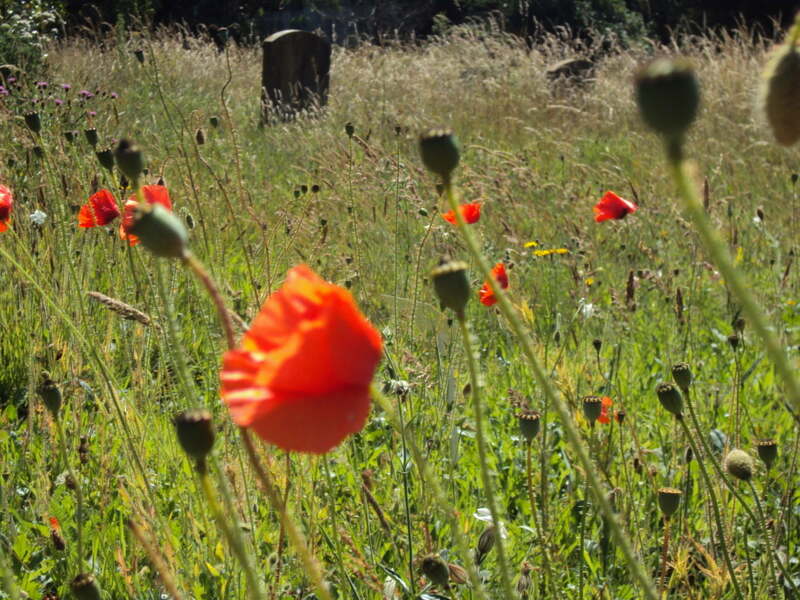 The space has been sown with native wildflowers and this has enhanced biodiversity in the cemetery. Our cemeteries are home to numerous bird species, butterflies, mammals, amphibians and reptiles. We encourage wildlife by creating log piles, collecting leaves to produce compost and encouraging mini ecosystems.